Or maybe it’s Sea Chrome, or California Secretary..
Let’s just say horse racing is not my thing. It is less my mom’s thing, made worse by the fact TENNIS is actually HUGELY her thing and one of the biggest tennis tournaments of the year was on today–the FRENCH OPEN–but was given extremely short shrift by the networks, SO short, we were able to see NONE of the only match played today–the WOMEN”S FINAL–because coverage began at 6:00AM which is just beyond ridiculous. But omg, the hours devoted to a very quick mile-and-a-quarter horse race…. My mom was fit to be tied. (And tomorrow’s French Open MEN’S final features her all time favorite tennis player, her favorite since before anybody else knew or cared about him–Novak Djokovic–but his final also starts at 6:00am and that’s just not happening. Anyway… it was a lay low day, which happens a lot more these days…therefore horse racing. 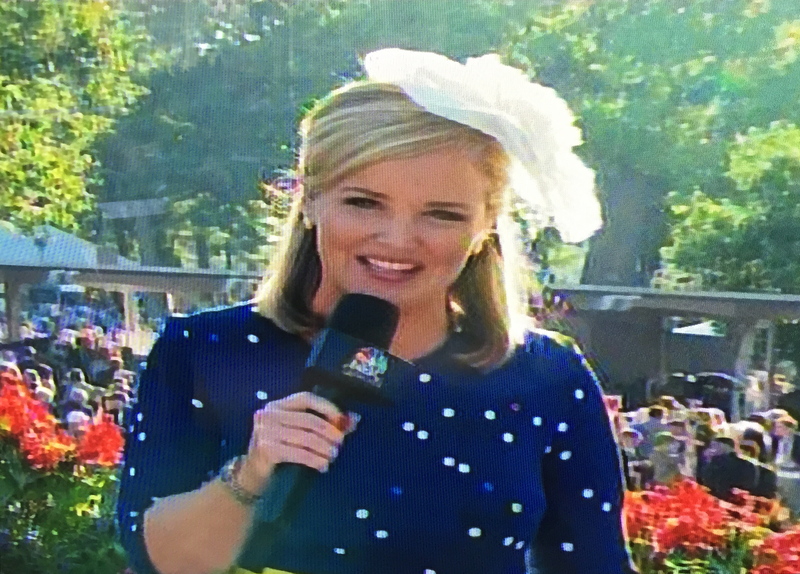 She’s pretty, but what the hell is that on her head? Must be a race track fashion thing. Mostly it confirmed for me that I am absolutely not their target audience. TWO HOURS into the coverage, the race was actually run. To spice things up, mom put a dollar on American Pharoah, and I put a dollar on anybody else. We took the TV off mute and, for two and a half minutes, things got reasonably interesting. Anyway, shortly after that big event, and I mean really shortly, we returned to our gin rummy series, now in its third day. I am getting creamed, so, in addition to winning a buck on America’s new triple crownee, my mom’s day is looking up. Just to offer a different perspective….coming from an ex-tennis player but also horseperson….I LOVED watching the first triple crown winner in 38 years. I even looked at pics of âAmerican Pharoahâ online after the race â what a beautiful animal. And worse than that, horse racing movies (like âSeabiscuitâ) are just about the only movies Iâll go see in the theatre anymore. And Iâm first in line! That being said, 3 hours of racing coverage was a bit much for a race that lasts 2 minutes. I only tuned in for the race and was so glad to see it. At times I need to temporarily put aside the big-picture oddities of the horse racing business. But is it worse than the oddities of football I sometimes ask myself?. However itâs truly a travesty what they do with womenâs tennis â or donât do with it rather. There….now you know Kari youâve got friends of all kinds! By the way, witty title as usual! I think thatâd be âCalifornia SecretarIATâ though. I don’t object so much to a horse race, but rather to the 2.5 hours of a ridiculous “media event.” I really tire of our bloated, self-important media that commodifies everything and relentlessly manipulates and panders. It’s embarrassing. I said above that I appreciated the athleticism of the horses (and probably the jockeys–I just don’t know enough to know what that requires). I just went to a horse show outside Davis a few weeks ago and thought it was totally impressive. I grew up around horses and always thought horse people were the coolest. No lack of appreciation there. I would love to go riding with you one day and have you really show me an insiders view of the horse world. I do know it’s Secretariet… I was just goofing around. Well, I love horses and so enjoy watching the 3 races of the Triple Crown, though I admit that all the hoopla beforehand is ridiculous. 30 minute before the race would be just. fine. 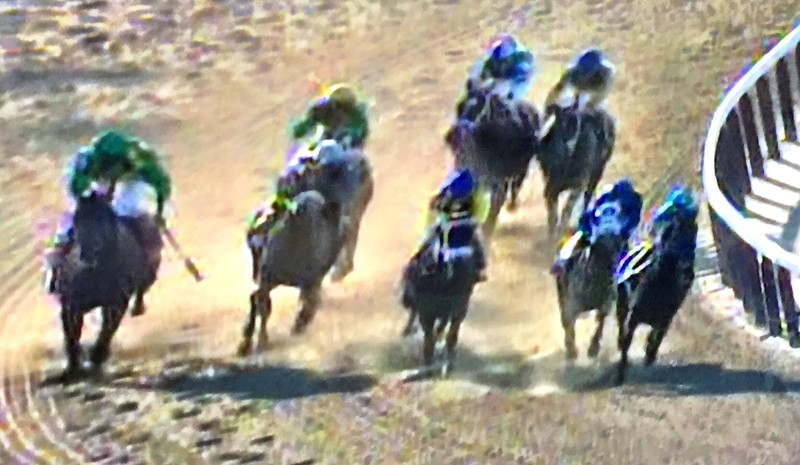 I had tears streaming down my face when American Pharoah crossed under the wire. 37 years is a LONG time! Now tennis is a whole different ballgame. 🙂 Not a big fan, especially when it preempts something I was hoping to watch.